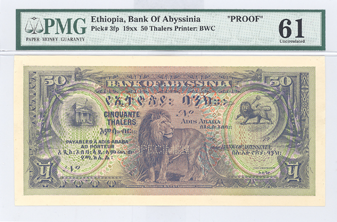 The Bank of Abyssinia, inaugurated in 1906, was the beginning of banking in Ethiopia. In 1915, notes denominated in birrs in Amharic and thalers in French translation were introduced in the units of 5, 10, 100 and 500, with dual-language inscriptions. The 50-unit note was later added in 1929, and a specimen example is shown here. Initially, these notes were not generally accepted and were used mainly by merchants and foreigners. In 1931, Emperor Haile Selassie introduced reforms into the banking system and the Bank of Abyssinia became the National Bank of Ethiopia. Soon after in 1935, Ethiopia’s early initiative in African banking was cut short by an Italian invasion that established Italian banks throughout Ethiopia. Because banknotes from this period circulated for only a short time, they are rare in issued form and few are known. The featured note has a representation of the Lion of Judah bearing a staff surmounted by a cross on the right, and a picture of the Bank’s building on the left.